The reworked denim, foreign language logo tees and sporty athleisure staples of the moment just got a very avant-garde makeover. At shows like Acne and Nina Ricci, designers put a new spin on staple items. From the Instagram-ification of fashion shows to the collections from Comme des Garçons, Céline and Alexander McQueen. All the highlights — and some lowlights — of the men's collections. 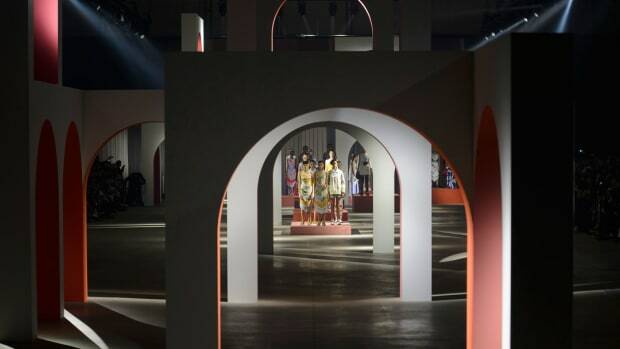 Junya Watanabe chose the basement of the Grande Galerie de l’Évolution at the Museum of Natural History for his early Saturday morning runway show, setting the tone for what was in store. New show reviews and galleries are in from Paris! Check out John Galliano, Maiyet, and Junya Watanabe. When Junya Watanabe is focused on one particular subject, he is totally focused on that subject without any distractions whatsoever. At his Saturday morning show at the Garage Turenne, Mr. Watanabe returned to one of his favorite garments--the classic black leather biker jacket--and developed an entire collection around the endless permutations of this revered icon. Sunday may be a day of rest, but in Paris, Fashion Week has sure been keeping us busy! Check out Vanessa Bruno's bohemia collection, Issey Miyake's DIY beach bum aesthetic, and Junya Watanabe's sophisticated sportswear. Junya Watanabe presented a collection that revolved solely the role of athletic wear in contemporary fashion. Even with the summer Olympics over, Mr. Watanabe might be on to something here. Name: Tommy Ton Occupation: Photographer, Blogger How do you take your coffee? I don't drink coffee. What do you like to drink? I drink lots of fresh pressed juices. Long Nguyen is the Co-Founder/Style Director of Flaunt. PARIS--Over the sounds of Argentinian music evoking the atmosphere of a morning in the Gaucho plains, Junya Watanabe sent out a stunning collection of romantic and emotional clothes early Saturday morning. The show started with deep colored lace transparent dresses with black spaghetti strap slips and ended with the most elegant transformation of the trench coat seen on any runway. But if there were any references to Argentina and its southern mythical plains so romanticized in literature, it was just the coming and going of the Spanish vocals on the soundtrack throughout the show, rather than any literal translation in the clothes. Long Nguyen is the co-founder/style director of Flaunt. PARIS--There could not have been a better morning to stage a show outdoors than last Frida, when designer Junya Watanabe presented his spring menswear in the courtyard of a school on the edge of the Luxembourg Gardens. Under the bright sunshine, just yards beyond the pear fruit bearing trees and with George Harrison's “My Sweet Lord” blasting over two mounted loudspeakers, Mr. Watanabe imagined the look of farm life without ever having any actual living experience. There were tan cotton overalls rolled up with a faded chambray shirt, low front cut denim overalls with floral print cotton shirts and caramel wellies, as well as light pink cotton overalls paired with a blue utilities jacket. The hair in Paris was big. Not 80s big, but sculptural and dramatic. 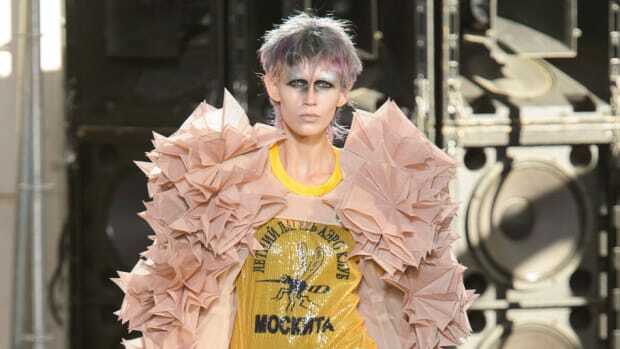 Ann Demeulemeester and Junya Watanabe went tall and spiky. Haider Ackermann and Issey Miyake created haute aliens, while Yohji Yamamoto and Gaultier did beehives in rainbow and shades of grey. Walk under doorways at your own risk. Trendspotting: "To Thine Own Self be True"
Fashionista contributor Long Nguyen is the co-founder/style director of Flaunt. PARIS-Despite the male voice's slow reading of the French poet Arthur Rimbaud’s Ophélie--a Symbolist sonnet written when Mr. Rimbaud was 17 years old in three parts, describing the fictive lover of Shakepeare’s Hamlet who eventually succumbed to insanity and death by drowning in a river--over the soundtrack the Junya Watanabe show on Saturday morning, the designer’s fall collection is anything but soft poetry. SS11 fashion week was filled with amazing collections, which were in turn filled with inventive and unique fashions. We couldn't just pick ten, so we've selected 20 top looks for you instead.